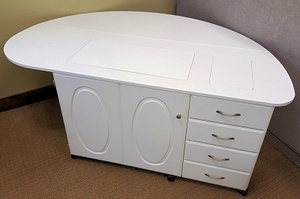 The 7020 Venus sewing cabinet has a very large opening, to accommodate nearly any machine. Venus's large surface area is great for cutting mats. 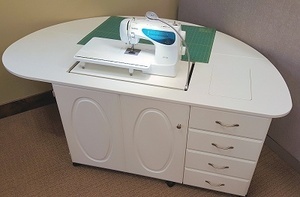 Fashion Sewing Cabinets has included their Electric Lift for the perfect solution to handle the weight of your machine and allow you to conveniently store/hide when not in use. Of course, you also get a cover for the opening, allowing you to create a nice flat & ample workspace to utilize when your machine is parked inside the cabinet. Large surface has contoured edges for no snag no drag design. Fold away leaf, extends work surface and provides multiple work areas. With convenient notion tray and notion tray cover . * Some assembly is required. Due to the shape of the top, it ships in a separate box and requires placing on the top of the cabinet, locking the cams and two screws to complete the lift attachment. The drawer pod ships retracted in the cabinet and requires extension and 4 bolts affixed. The unit ships without the castors installed.